We have become so spoilt by the choice of fruit and vegetables in our supermarket that it’s easy to forget which fruit and vegetables are in season and which aren’t. Its great to have choice and variety but we should embrace seasonal fruit and vegetables and make extensive use of it while it is at its best. In short seasonal fruit and vegetables are more nutritious, tastes better, are less toxic and often less expensive. As seasonal produce is fresher it is more likely to be higher in nutrients. Fruit and Vegetables tend to have good sources of anti-oxidants such as vitamin C, folate and carotenes which are all very important to health. Antioxidant levels decline rapidly when produce is stored. Fruit and vegetables picked to be eaten in season is going to look and taste better as its been naturally ripened and harvested at the right time rather than being picked under ripe in order to be transported and ripened in hot houses at a later stage. Fruit and vegetables grown for export and future consumption is much more likely to have been gasses, irradiated or preserved in wax to extend the shelf life. Fruit and vegetables sourced in season tend to grow in abundance and if you buy them locally you are avoiding the extra costs of transport, preservation and storage. 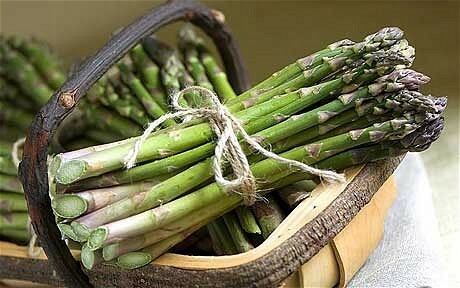 Asparagus is relatively rich in protein compared to other vegetables. It is an excellent source of potassium, folic acid, vitamin C and A. Asparagus is great steamed and can be added to salads with a refreshing lemon dressing. Broccoli is a fantastic super food, it is a good source of iron and a great immune booster. Again broccoli is great steamed and can be eaten raw in salads. New Potatoes are not a great source of nutrients but they do provide carbohydrate for energy and small amounts of vitamin C. New potatoes do have a lovely flavour at this time of year and are great steamed or boiled with fish or in a salad. Radishes provide an excellent source of vitamin C and stimulate the liver and digestion. They are best eaten raw and they provide a lovely kick to a salad. Rocket is a mustard like leafy green which adds a distinctive peppery taste to salads. Again Rocket is a great stimulant for the digestive tract enabling us to digest our food more effectively. Rocket is an excellent source of antioxidants. Rocket generally is a great addition to a salad and a very simple side salad of rocket and parmesan cheese makes an excellent complement to a meat or pasta dish. Rocket is good in pesto too. Cherries, the darker the cherry, the better it is for you as it contains a higher concentration of flavonoids. Add a little cinnamon and lemon zest to make cooked cherries extra special. For pure indulgence, cover pitted cherries in melted dark chocolate and chill to harden. ← Eat Fat, Lose Weight, this is Atkins right?